What to Watch For: Brad Keselowski attempts to win at Auto Club for the second straight season. His car owner, Roger Penske, constructed Auto Club Speedway and has two wins there as an owner. … Jimmie Johnson, who leads all drivers with five wins at Auto Club, tries to surpass Dale Earnhardt in the NASCAR Sprint Cup Series record books with his 77th career victory. … Phoenix race winner Kevin Harvick goes for his second straight checkered flag. 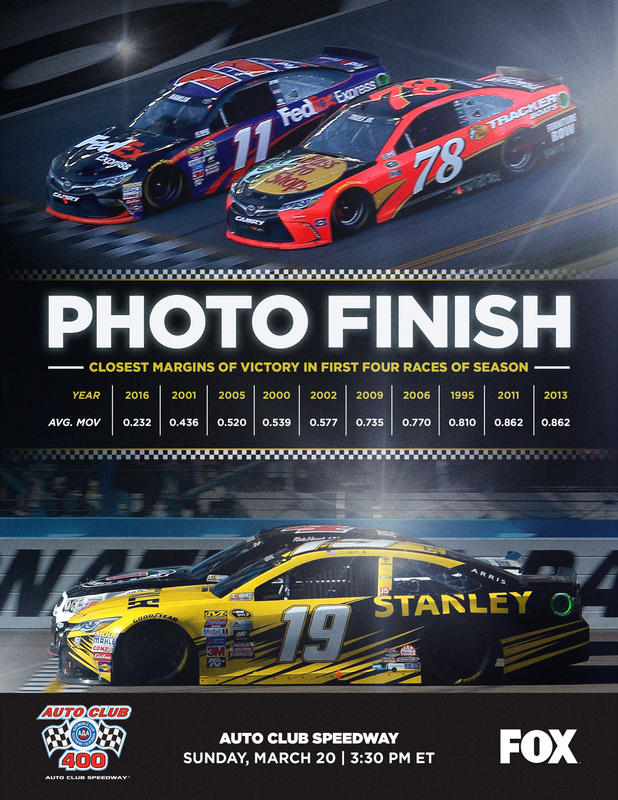 … The average margin of victory in the NASCAR Sprint Cup Series season is 0.232 seconds – the closest margin of victory since NASCAR began keeping the stat in 1993. … Last weekend’s runner-up, Carl Edwards, claims the second-best average finish at Auto Club (8.8). What to Watch For: Daniel Suárez looks to extend his eight-point standings lead over Elliott Sadler. … Sunoco Rookie of the Year contender Erik Jones goes for his fourth straight top-three finish. … Kyle Busch will attempt win his fourth consecutive NASCAR XFINITY Series race, tying a series record set by Sam Ard in 1983.